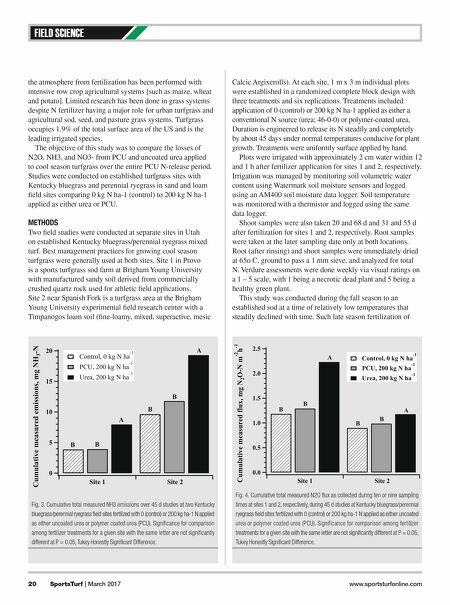 20 SportsTurf | March 2017 www.sportsturfonline.com FIELD SCIENCE the atmosphere from fertilization has been performed with intensive row crop agricultural systems [such as maize, wheat and potato]. Limited research has been done in grass systems despite N fertilizer having a major role for urban turfgrass and agricultural sod, seed, and pasture grass systems. Turfgrass occupies 1.9% of the total surface area of the US and is the leading irrigated species. The objective of this study was to compare the losses of N2O, NH3, and NO3- from PCU and uncoated urea applied to cool season turfgrass over the entire PCU N-release period. Studies were conducted on established turfgrass sites with Kentucky bluegrass and perennial ryegrass in sand and loam field sites comparing 0 kg N ha-1 (control) to 200 kg N ha-1 applied as either urea or PCU. METHODS Two field studies were conducted at separate sites in Utah on established Kentucky bluegrass/perennial ryegrass mixed turf. Best management practices for growing cool season turfgrass were generally used at both sites. Site 1 in Provo is a sports turfgrass sod farm at Brigham Young University with manufactured sandy soil derived from commercially crushed quartz rock used for athletic field applications. Site 2 near Spanish Fork is a turfgrass area at the Brigham Young University experimental field research center with a Timpanogos loam soil (fine-loamy, mixed, superactive, mesic Calcic Argixerolls). At each site, 1 m x 3 m individual plots were established in a randomized complete block design with three treatments and six replications. Treatments included application of 0 (control) or 200 kg N ha-1 applied as either a conventional N source (urea; 46-0-0) or polymer-coated urea. Duration is engineered to release its N steadily and completely by about 45 days under normal temperatures conducive for plant growth. Treatments were uniformly surface applied by hand. Plots were irrigated with approximately 2 cm water within 12 and 1 h after fertilizer application for sites 1 and 2, respectively. Irrigation was managed by monitoring soil volumetric water content using Watermark soil moisture sensors and logged using an AM400 soil moisture data logger. Soil temperature was monitored with a thermistor and logged using the same data logger. Shoot samples were also taken 20 and 68 d and 31 and 55 d after fertilization for sites 1 and 2, respectively. Root samples were taken at the later sampling date only at both locations. Root (after rinsing) and shoot samples were immediately dried at 65o C, ground to pass a 1 mm sieve, and analyzed for total N. Verdure assessments were done weekly via visual ratings on a 1 – 5 scale, with 1 being a necrotic dead plant and 5 being a healthy green plant. 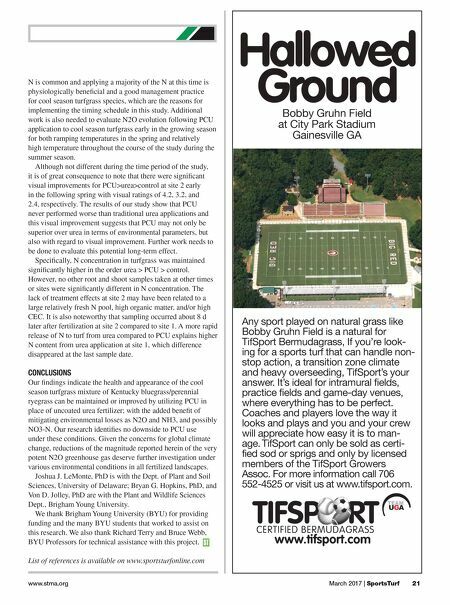 This study was conducted during the fall season to an established sod at a time of relatively low temperatures that steadily declined with time. Such late season fertilization of Fig. 3. Cumulative total measured NH3 emissions over 45 d studies at two Kentucky bluegrass/perennial ryegrass field sites fertilized with 0 (control) or 200 kg ha-1 N applied as either uncoated urea or polymer coated urea (PCU). Significance for comparison among fertilizer treatments for a given site with the same letter are not significantly different at P = 0.05, Tukey Honestly Significant Difference. Fig. 4. Cumulative total measured N2O flux as collected during ten or nine sampling times at sites 1 and 2, respectively, during 45 d studies at Kentucky bluegrass/perennial ryegrass field sites fertilized with 0 (control) or 200 kg ha-1 N applied as either uncoated urea or polymer coated urea (PCU). Significance for comparison among fertilizer treatments for a given site with the same letter are not significantly different at P = 0.05, Tukey Honestly Significant Difference.